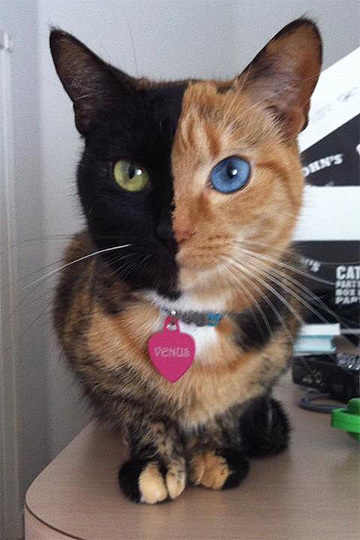 Meet Venus, a Chimera cat. Videos prove that this photo is NOT Photoshop! 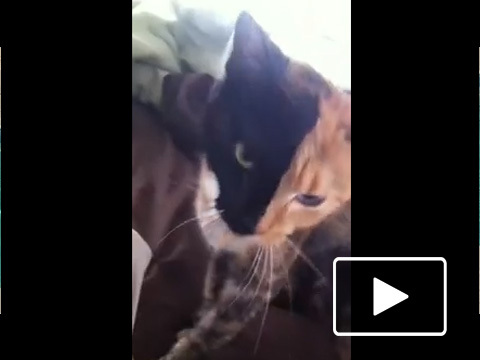 Meet Venus, a Chimera cat with coloring and eyes that will blow your mind! And yes, she’s a Facebook superstar! Are you a professional cat sitter or a cat shelter volunteer concerned about bringing home diseases, or smells which could upset your cats? When your cat faerie was a cat sitter, and an SPCA cat socializer, and sold our cat products at cat shows she devised a method for removing the smells of other cats, and to make sure that diseases had not hitched a ride. Enter the house through the garage. At the washing machine change into fresh clothes and shoes which you placed there before you left. Toss the clothes into the washer, then go inside the house. With warm soapy water wash hands up to the elbow, and be sure you get between your fingers too. Your cats probably won’t detect the smells of other cats and there’s no worry about making your cats sick. Homeopet homeopathic remedies for your cat. Match up your cat’s symptoms with the formulas. We really love the Homeopet natural line of remedies and have been fans for many years. The founder of Homeopet is a doctor and researcher and he’s put decades of knowledge gathering and keen attention to detail into these products. Everything is of the highest quality, no scrimping because the products are for animals like we may find in the products of other companies. And you know how we are at Cat Faeries – total fuss budgets when it comes to quality! The chart below will allow you to match up your cat’s symptoms to the correct remedy. You would alternate doses. So, every 2nd dose –switch. You would dose 3 times a day. In the AM, around lunchtime, and then again in the PM. The addition of Cleanz Detox will remove the toxins which could be the cause of the skin problems. You would follow the same dosing pattern as above BUT with each dose wait 30 minutes and give a dose of Cleanz Detox. You would dose in the same manner we explained for Skin & Itch and Skin & Seborrhea. We also like Joint Stress and Cleanz – Detox in combination with each other as older cats have painful joints and years of toxin build up. Cleans the system of all the toxins the body has accumulated over the years. These toxins come from a variety of areas: spot on treatments, yard sprays, house sprays, air fresheners, wormers, shampoos and preservatives in foods are just some of the areas. The toxins build up in the system and decrease liver and kidney functions which results in the pet looking and acting less healthy. Also purges radiation. Smelly ears with wax buildup, ears smell like stale cheese. Have you had a psychic hit that a special cat was about to enter your life? This is such a cool story. How many of us had a psychic hit that there was a special cat (or another animal) about to enter their lives? In 2004, after being cat-less for about a year, Kris Eugene-Johnson felt ready to adopt and suggested to her husband, Ralph Johnson, that they visit the San Francisco SPCA. “No need to,” he replied. When she raised an eyebrow, he continued. “For a few days now, I’ve been feeling that a cat is on its way to us. We’re about to get adopted.” Crazy, yes. But he convinced Kris that they should wait. And so they did. Continuing Care. Worried that your cat will outlive you? Plan ahead for the care of your cat. The Peninsula Humane Society’s “Continuing Care Program” is a valuable service as it helps you prepare for your animal’s future in case you pass away during their lifetime. They will connect your animal companion with a home of your choosing or arrange for their care while they look for a loving new home. This reduces strain on your family and friends. And it provides invaluable stability for your animal friends. If you live in the Bay Area just enroll by contacting them. There is no charge for joining. But they do ask that you make an annual donation to maintain a membership in the Peninsula Humane Society. If you do not live in the Bay Area, simply show this article to the director of your shelter or humane society. Urge them to contact Lisa Van Buskirk either by phone or by email. She’ll tell them how to set it up. She won’t mind if they use the same name (Continuing Care) or create their own name. Cat Faeries thinks that it would be way cool if ALL shelters called it Continuing Care so that it becomes a known option that a person can simply do a Google search for in their area. Lisa is a lovely person who is ready to help: 650 340-7022 x327 or Lvanbuskirk@PHS-SPCA.org.